You are unlikely to see the name of Lieutenant Colonel Herbert Francis George Carter on the list of Commanding Officers of the Leeds Pals. However, a letter dated 24th July 1918 sent by him to the War Office, justifying his rank of Lieutenant Colonel*, stating “I commanded 15th WY (31st Div & 93rd Bde orders) from 11th Feb till 17th Feb 1918” proves he did command the battalion for one week. It was temporary command in the absence of Lieutenant Colonel Stuart Taylor who was preparing for promotion to Brigadier General prior to taking command of the 93rd Brigade on 15th March 1918. Lieutenant Colonel Carter had assumed command of the 18th Battalion (2nd Bradford Pals) on 2nd July 1916, a post he held until their disbandment on 15th February 1918; he then took command of the 18th Battalion Durham Light Infantry until wounded in action at Mayenville on 27th March 1918 (five times from his shoulder to his left ankle) and evacuated home. (*In fact he remained a Substantive Captain, Brevet Major and Temporary Lieutenant Colonel). Herbert Carter came from a military family, his father was General Francis Charles Carter. He was born on 2nd August 1885 at Dalhousie in the East Indies (India) where his father was serving as a Lieutenant with the 2nd Battalion Northumberland Fusiliers. Herbert had strong links with West Yorkshire through his mother, a Thornhill of Fixby Hall, Huddersfield. The Thornhills were Yorkshire gentry back to the middle ages. Their wealth grew in the industrial revolution when coal was found on their land. He also joined another well-to-do family when he married Hermione Grace Guinness, born on 25th May 1898, daughter of Gerald Seymour Guinness and Eleanor Grace de Capell Brooke, on 26th June 1918. Her family lived at Dauntsey Park, Chippenham in Wiltshire. Herbert was therefore well connected and was sufficiently well known to the royal family for a member of the King’s staff to write enquiring after his health when he was taken seriously ill in Russia in 1919. Lieutenant Colonel Herbert Carter was educated a Wellington, entered Sandhurst in 1903 and was commissioned into his local Regiment the King’s Own Yorkshire Light Infantry (KOYLI) in 1904 at the age of eighteen. He was an intelligent and capable young officer who achieved rapid promotion to Lieutenant and was made Assistant Adjutant of the 2nd KOYLI shortly after his twentieth birthday. He spent some time in Crete which gave him a taste for foreign travel and he left the Battalion to complete language courses, after which he served in the British Embassies as a Military Attaché in Russia and Japan as he was one of the Army’s few first class interpreters in Russian and Japanese. When war came in 1914 Captain Carter returned to join the 2nd Battalion KOYLI in Belgium, arriving at the front on 25th October 1914. He took part in the desperate defence of the Messines Ridge where casualties were heavy and within six days he was the only surviving officer in his battalion. He was wounded at Hooge 17th November 1914 and became the first KOYLI officer to be awarded the Military Cross, for gallantry on the Ypres Messines Road on the 31st October 1914. After recovering from his wounds Herbert Carter spent time in Gallipoli as ADC to General Sir Aylmer Gould Hunter-Weston with the 29th Division but returned to England when General Hunter-Weston was evacuated out of Cape Helles with sunstroke and exhaustion in July 1915. He joined the newly formed 31st Division at Ripon as a staff officer under the new command of General Robert Wanless-O’Gowan who had been his Brigadier in Flanders. Herbert was serving as a Staff Officer at GHQ on the 1st July 1916 and following the disastrous attack on the Somme (one of the casualties being the Commanding Officer Lieutenant Colonel Maurice Kennard) was given command of the 18th Battalion, West Yorkshire Regiment on 2nd July. Following the recovery of survivors of the failed attack the Battalion could only muster 60 men. He commanded the Bradford Pals 2nd Battalion until its disbandment in February 1918. He will, however, be remembered for a decision he made in September 1916 when two men under his command, Privates H Crimmins and A Wild, deserted. After these men were arrested they were tried by Court Martial and sentenced to death. Lieutenant Colonel Carter signed their death warrant and the men were ‘shot at dawn’ on the 5th September 1916 and are buried at Vielle-Chapelle New Military Cemetery in France. Some questioned his decision to sanction the death penalty. During his time as a Military Attaché he undoubtedly had connections with the Intelligence Services and was a fluent Russian speaker. This resulted in a posting to the British Military Mission, Vladivostok in 1919 where, as Senior British Training Officer, he helped to train the White Russian forces. This posting was short-lived as Herbert Carter died of double pneumonia following influenza on 28th February 1919, in the American Red Cross Hospital, Russian Island, Vladivostok, Siberia in Russia. He is buried in the Naval Cemetery in Vladivostok. Interestingly, the War Office notified Lady Neville Chamberlain of the death of Herbert Carter, stating that it was Colonel Carter’s wish that ‘his wife should not be informed till after her confinement expected in six weeks’. Buckingham Palace also wrote to the War Office on 6th March 1919 requesting that the death should not be published in the press as the family ‘was anxious to keep the news of his death from his wife’. However, Grace was eventually told of his death by her mother and gave birth to a baby daughter. She re-married in May 1923 to Air Marshal John Cotesworth Slessor, one of the architects if British air strategy during and after the Second World War. She died on 14th September 1970 age 72. For his service Herbert was awarded the Military Cross, 1914 Star with clasp, British War Medal and Victory Medal with MID (he was Mentioned in Despatches five times 17th February 1915, 28th January 1916, 25th January 1917, 22nd May 1915 and 21st December 1917. His widow also received a bronze Memorial Plaque and a Scroll which were given to all bereaved families. The announcement of the Military Cross was published in the London Gazette on 18th February 1915 although there was no citation. We recently received a photo and some information concerning Wilfred Boyce, a Leeds Pal, from his son Keith, now living in Australia. To have such a direct connection to a Pal is very unusual. The photo shows Wilfred front row left, with a centre parting. The others are probably also Pals, but only two have cap badges visible. 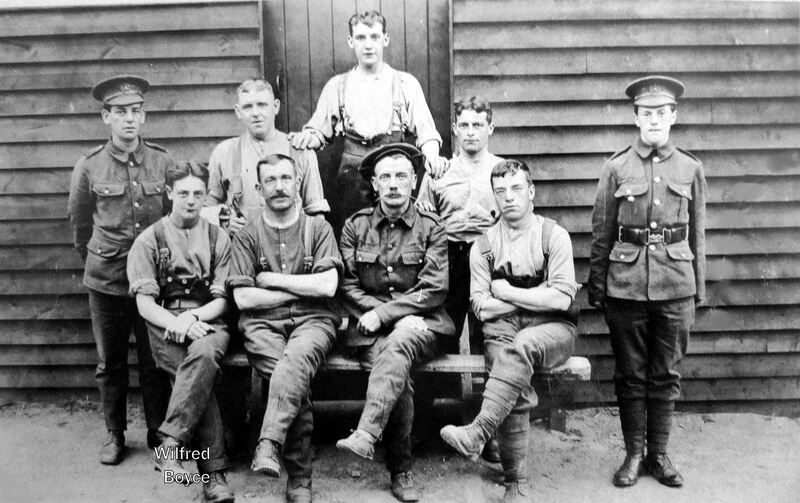 It appears to be quite an early photo as Wilfred is not yet showing the strains of war. It was probably taken at one of the training camps. He did survive the war, but at some cost. Had it been a later war he would probably have been diagnosed with Post-traumatic Stress Disorder, but as it was he just had to struggle on. In 1920 he married Lily Baines, and they had three children, Kenneth Stanley Boyce, born 1923, Shirley Ann Boyce, born 1932 but who died eight years later, and Keith Wyndham Boyce, born in Sherburn in Elmet in 1935. As a family ‘they moved around a lot’, according to Keith, possibly following the work, but on the 1939 Register Wilfred was listed as ‘upholsterer (incapacitated)’, living at 7 Lyndhurst Avenue, Bredbury, Cheshire. They ended up at 30 Cross Green Lane, Halton. Finally, on 22nd April 1948 they left England on the Queen Elizabeth, bound for New York, from there flew to San Francisco, and then on to Aukland, NZ, where they stayed for a year. Exactly one year later they sailed for Australia, where they settled in Adelaide, and it was here, in 1955, that Wilfred ended his life. Like many others he had not been able to get over his wartime experiences and ‘was not a happy person’. Wilfred, Lily and Kenneth all died in Adelaide, but Keith still lives with his wife Shirley in Morgan, a small settlement 100 miles NE of Adelaide. They have a successful family of two children and four grandchildren. Keith’s middle name is Wyndham, and his mother Lily told him he was named after one of his father’s mates, but so far we have not been able to identify him. So if anyone can help here please get in touch. E Raymond Hepper, as he preferred to be named, came from a well to do family in Headingley, Leeds where he was born on 19th July 1892. His father Edward Henry Hepper, who was born in 1867 and died in 1931, ran the family firm Hepper and Sons, Chartered Surveyors, Auctioneer and Estate Agents from their office at Hepper House, East Parade, Leeds. His mother was Gertrude Emily Hepper, née Bedford (1869-1954), and his siblings were Marjorie (1898-1988) and Alan Bedford (1902-1995); another child had died at a young age. The family home was at Woodcote, Wood Lane, Headingley. Fortunately Raymond kept a diary during the war, a copy of which is held by the Imperial War Museum (IWM) Archives, which was transcribed by his second son, Nigel, in 2011 and this, with his Service Record, provides a detailed account of him and his war service. He enlisted in the 17th Battalion, West Yorkshire Regiment (the Bantams), on its formation in December 1914, after a period of service in the Leeds University Officer Training Corps (OTC). Training then took place at Ilkley in Yorkshire, Rougely in Staffordshire and Perham Down in Hampshire before the Battalion deployed to France on 31st January 1916. They sailed from Southampton on the Duchess of Argyll landing at Havre the following day. The Bantams were soon in the front line and Raymond remained with them until they amalgamated with their sister Pals Battalion, the 15th (City) Battalion in December 1917, apart from a short spell on the staff of the Brigade Headquarters. Raymond had many skills and interests which he used to good effect during the war. As a qualified Chartered Surveyor (although his Service Record lists his trade as ‘Auctioneer and Valuer’) he was able to draw maps from the aerial photographs taken by the Royal Flying Corps (RFC), which is probably why he was chosen for intelligence training in 1918. However, among his many interests, that included antiquities, stamps, fine arts and history, his greatest passion seemed to be natural history and wherever he travelled on the battlefront he would record the birds, plants and trees he had seen. He was also known to have had a keen sense of humour and would perform sketches and was seen to ride a pony to the frontline trenches. His humour undoubtedly improved moral in the Battalion during those difficult years at war. He was among a number of officers of the 17th Battalion who chose not to join the newly formed 15/17th Battalion as they felt their particular skills could be utilised better elsewhere. After an attachment to the 16th Battalion he was posted for a short time to the 12th Battalion before returning to England to attend a course in Intelligence Training. This lasted from January to October 1918 and saved him from the great German offensive of the spring of 1918 and the final advance of the Allies later in the year, both of which were bloody affairs. When the long course finished he was posted to the 15th (Service) Battalion, Essex Regiment, promoted to Acting Captain and given a Company of more than 1,000 men to command. However, when he arrived in France on 16th October 1918 he was moved to the 8th Battalion (Leeds Rifles) and remained with them for the final month of the war and the advance into Germany as part of the Army of Occupation. He returned to England in January 1919 where he went through the demobilisation process at Prees Camp and was released on 27th January 1919. After the 1914-18 war Raymond returned to the family business and married, first, Ada Cecilia Heasman in 1924; she was born on 16th February 1900 and died in 1963. He and Ada had two sons, John Rylstone, who was born on 27th February 1925 and died in 1991, and Frank Nigel Hepper who was born on 13th March 1929 and died on 16th May 2013. During the Second World War the Hepper family evacuated to a cottage in the Lake District and formed a market garden with livestock to aid the war effort. However, it seems as though Raymond Hepper served before and during the war in the Police Special Constabulary as he was later awarded a Long Service Medal. After the 1939-45 war Nigel, as he liked to be known, became a botanist and specialist in the African flora and was principal scientific officer and assistant keeper of the herbarium at the Royal Botanic Gardens, Kew. He began work at Kew in 1950 and continued there until his retirement in 1990, a period interrupted only by two years of national service with the RAF (1950-52). He undoubtedly inherited his father’s interest in nature and during his life he wrote a number of books on the subject. Raymond’s second wife was Flora Muriel Steel Lacy. Edward Raymond Hepper died on 15th April 1970. For his service during the First and Second World Wars, and his time in the Special Constabulary, he was awarded the War Medal, Victory Medal, Somme Medal, Defence Medal 1939-45, Coronation Medal 1937 and Coronation Medal 1953. The National Archives – Service Record. Imperial War Museum – Hepper’s War Diary transcribed by his son and published in 2011. Ancestry / Findmypast – Births, Marriages, Deaths and Census records. Frank Nigel Hepper’s – Obituary. Thomas Connors was a man who had completed his military service and probably did not need to re-enlist in 1914. He had joined the King’s Royal Rifle Corps at a very young age before formally attesting in the Royal Munster Fusiliers on 15th November 1888 and completing 21 years of service (2½ before the age of 18) prior to retiring in 1909. He served in Malta for 8 months and Gibraltar for 1 year and 1 month, and finally at the Royal Munster Fusiliers Depot. He was 5’ 10” tall with brown hair, grey eyes and a fresh complexion and his character was described as good. He was awarded an NCO Good Conduct Badge. Thomas retired to a pension as a Sergeant on 14th November 1909 at Cork, Ireland age 36 years. His trade was shown as ‘musician’ and his residence on retirement was given as c/o Mr J Hogan, 2 Victoria Terrace, Wexanden? Road, Cork. An Irishman by birth, Thomas was born on 30th June 1872 at Mallow, Cork. His father was John Connors and mother possibly Catherine Coglan. It is thought Thomas married Mary Connors, née Kelly, in Limerick in 1889. She was born at Mallow in 1871 and died at Leeds on 4th August 1949. They had seven children but sadly four died at an early age. By 1911 Thomas and his family were living at 20 Portland Street, Leeds. He was 39 years of age and employed as timekeeper in a wholesale warehouse. The surviving children were Melita (the name for Malta in Roman times) Dorothea, born at Malta on 24th April 1901 and died 21st October 1971; she married George Christopher Norton who was born on 17th September 1900 at Blackburn and died on 18th February 1976, and Ada Anne Connors, who was born on 13th June 1903 at Limerick and died on 16th May 1986 at Wakefield; she married twice, first in 1936 and then in 1956. Their brother Thomas John was born at Tralee Barracks, Limerick, Ireland on 19th July 1904 and he died on 3rd October 1977 at Leeds; he married Nellie Maw in 1928, she was born on 6th October 1903 and died in 1992. In 1912 Thomas joined the Leeds Corps of Commissionaires although he left in 1914 to become a Leeds Pals, one of the first to join. However, he remained at Colsterdale Camp as he was deemed unfit for overseas service. After the war he returned to the Corps of Commissionaires before working for the Electricity Department of the Leeds Corporation. The 1918 Absent Voters List shows that Thomas and Mary were living at 28 Tonbridge Street, Leeds, where he died on 24th April 1929 age 55. He is buried in Killingbeck Cemetery, Leeds. The probate report records that his estate, valued at £215 9s 7d, was left to Ellen Carroll, wife of Patrick Carroll. Although Thomas did not qualify for First World War medals he had already been awarded the Mediterranean Medal 1901 for his service in Malta and Gibraltar. The photo shows Thomas with cap badge of Leeds Pals and RSM sleeve badge. 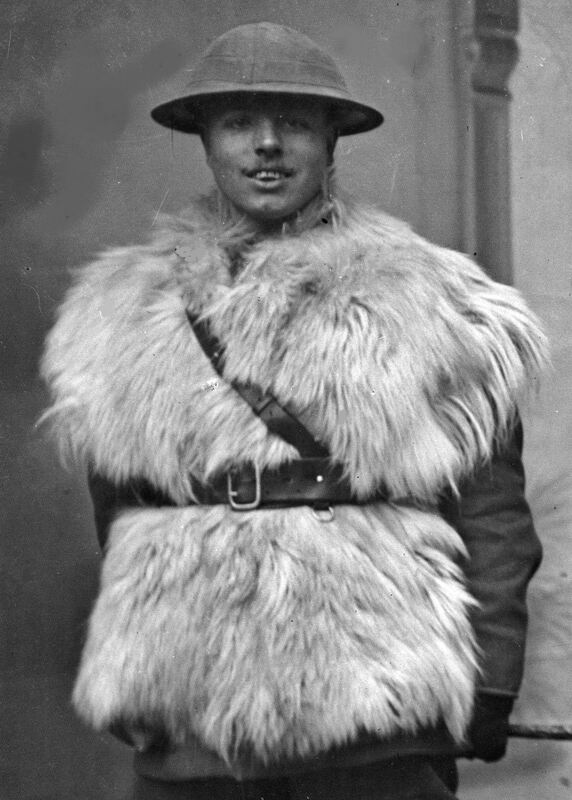 Henry Preston did not need to re-join the Army in 1914 as he had already done his bit for King and Country. He was 44 years old and had enlisted as 2579 Private Preston in the 1st Battalion West Yorkshire Regiment on 21st November 1889 at Scarborough, for 7 years in the Colours and 5 years on the Reserve. He was born at Scarborough, was a labourer by trade and had already served in the 3rd Battalion Yorkshire Regiment. A slight man, he was 5’ 4” tall, had a dark complexion, with grey eyes and brown hair. He weighed 130 lbs and had a 34” chest. His character was described as exemplary and he led ‘a thoroughly steady and sober life throughout his military career’ and ‘he was in every way trustworthy’. His mother Sarah Hinchbold came from Scarborough and his stepfather John Hinchbold from Leeds. After a year based in England, during which he was posted to the 2nd Battalion West Yorkshire Regiment, he moved overseas first to the East Indies (India) in 1891, then Gibraltar and West Africa in 1895, serving in the Ashanti Campaign, before returning to England in 1896. However, Henry’s overseas tours had not finished and he re-engaged in 1898 and deployed to South Africa in 1900, at the height of the Boer War, where he remained until 1904. Henry was promoted to Lance Corporal in 1892, Corporal in 1894 and Lance Sergeant in 1896, the year he transferred to the Army Reserve. He re-joined the Army in 1898 as a Corporal and was promoted Lance Sergeant in 1899 and Sergeant in 1900. 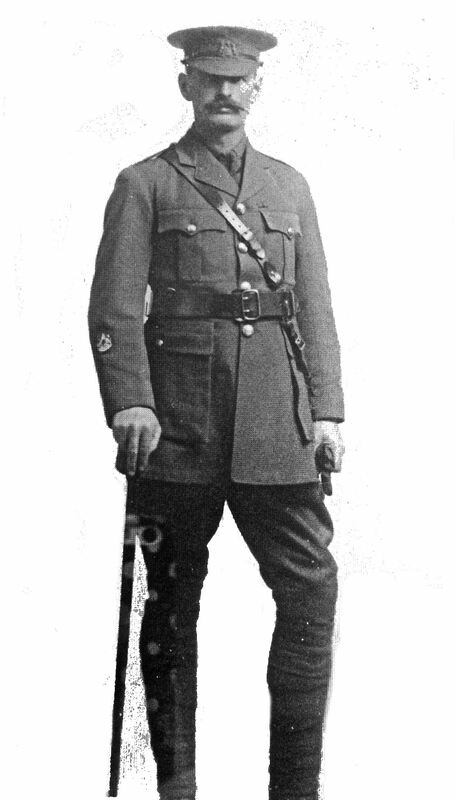 Further promotion followed, first to Colour Sergeant in 1903, the year after he had committed himself to 21 years in the Colours, and then Warrant Officer Class 1 in 1910. Henry attended a Musketry course at Hythe in Kent in 1905 and served in Belfast in 1906 before being posted to the 3rd Volunteer Battalion, West Yorkshire Regiment in 1907 on the Permanent Staff. He transferred to the 7th Battalion West Yorkshire Regiment at Carlton Barracks, Leeds, as a Colour Sergeant in 1908 and was appointed Regimental Sergeant Major of the Battalion in 1910. He remained on ‘Home Service’ from 1904 until his retirement to pension in 1912, having served 23 years. Henry’s intended place of residence on discharge was 13 Gledhow Terrace, Roseville Road, Leeds although records show he and his family settled in 5 Churchill Gardens, Blackman Lane, Leeds. However, he was a soldier through and through and re-enlisted, as a Private, in the 1st Leeds Pals on 7th December 1914 and on the same day was promoted Regimental Quartermaster Sergeant, and back to Warrant Officer Class 1 and appointed Regimental Sergeant Major of the 15th Battalion in January 1915. He served with the Leeds Pals at Colsterdale, Ripon, Fovant and in Egypt before arriving on the Western Front in France in March 1916. Sadly he was killed in action on the first day of the Battle of the Somme, when the 1st Leeds Pals were decimated on 1st July 1916. All 24 officers who went into action that day were either killed or injured and more than 500 soldiers were killed, wounded or missing. His body was recovered and is buried at Euston Road Cemetery, Colincamps, a short distance from the frontline trenches at Serre. He married Annie Jefferson Preston née Horsley, born at Cloughton, Yorkshire on 30th October 1869, at All Saints Church Scarborough on 15th May 1897. They had six children, Harry Horsley Percy born at Scarborough 23rd May 1898, Edith Annie at York 26th November 1899, Herbert Wilfred 21st February 1904 at Pietermaritzburg in South Africa, Frederick William born at Hollywood, Castlereagh, Ireland (now Northern Ireland) 17th June 1906, Walter Edward at Leeds 24th March 1908 and Marguerite 10th July 1910 at Leeds. Frederick and William attended Blenheim School and the family eventually settled at 5 Churchill Gardens, Blackman Lane, Leeds. In 1930 Frederick William, now a metal polisher, married Florence Pratt, a tailoress, at the Parish Church of All Saints, Leeds. A request for financial support for the family was made to the Ministry of Pensions, London by the Leeds Local Committee of the War Pensions Office, 2 Park Lane, Leeds and his widow Annie was subsequently awarded in 1917 a pension of £48 a year for herself and £22 compassionate allowance for two of her children (although six children are listed in the 1911 census, only two were granted the allowance. The others were older than 14, had left school and were deemed to be non-dependant). Her pension was increased to £104 in 1920, again when the Ministry of Pensions was prompted by the Leeds Local Committee of the War Pensions Office. In 1939 Annie was living with Harry Horsley Preston and his wife Victoria at 4 Wepener Place, Leeds. She died on 28th May 1964. For his long and distinguished service Henry Preston was awarded the Ashanti Star, Queens South Africa Medal with clasps Transvaal and South Africa 1901-02, 1914-15 Star, War Medal, Victory Medal and Long Service and Good Conduct Medal with gratuity (1909).